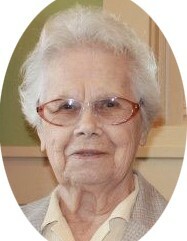 Paulette F. (Bray) Ogg, 97, passed away Wednesday, April 3, 2019. Born March 25, 1922 in Carbondale, OH to the late James and Lyda Mae (Sturgill) Bray, she was a lifelong resident of the Clinton/Canal Fulton area where she was a long time member of the Clinton Church of the Nazarene where she was a Sunday School teacher and Canal Fulton Nazarene Church. Paulette enjoyed working at the church socials, sewing, spending time outdoors, gardening and especially loved the time she spent with her family. In addition to her parents she was preceded in death by husband, Ernie; daughter, Patty and son, Stephen. Paulette is survived by her daughter, Debbie (Dave) Witte; grandchildren, Stephanie (Mark), Jeff (Beth), Matt (Laura), Amy, Tiffany, Erica; great-grandchildren, Nate, Lindsay, Natalie, Victoria, Nicole, Molly, Samantha, Ryan, Sara, Bryar, Eli, Emma, Carter; great-great grandchildren, Ryder, Max, Trevor, Finley, Ezekiel, Marlowe, Jack, Milo and sister, Bonnie (Lou) Korom. Funeral Services will be held SATURDAY, 4pm at the Swigart-Easterling Funeral Home, 624 Cherry St. E. (Rt. 93) Canal Fulton, Pastor Mike Hirschfelt officiating. Burial at Clinton Cemetery. Visitation Saturday, 2pm to 4pm at the funeral home. In lieu of flowers, memorials in Paulette's name can be made to Summa Hospice, 525 E Market St, Akron, OH 44304.